Are We Following Guidelines for the Management of Acute Pancreatitis? Background: In 1998 the British Society of Gastroenterolgy (BSG) published guidelines for the management of acute pancreatitis, which were further revised in 2003. These guidelines include 11 audit criteria, which allow individual units to appraise their performance, and allow for national comparison. 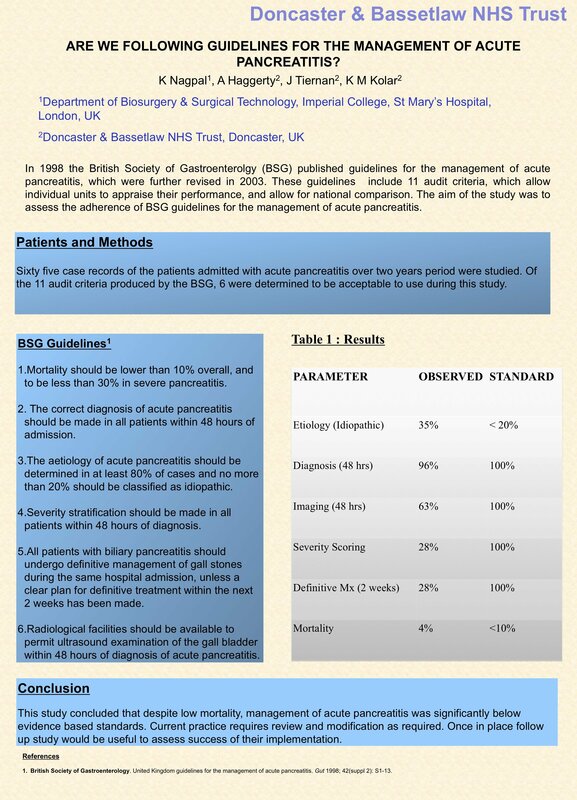 The aim of the study was to assess the adherence of BSG guidelines for the management of acute pancreatitis. Methods: Sixty five case records of the patients admitted with acute pancreatitis over two years period were studied. Of the 11 audit criteria produced by the BSG 6 were determined to be acceptable to use during this study. Results: Diagnosis was made in 96% of patients within 48hrs. Etiology could be identified in 65% of cases compared to the standard of 75-80%. Severity stratification was completely done in 8% of the patients which was well below 100% standard. 58% of patients had radiological investigation performed within 48hrs. Mortality was lower compared to audit standard. Definitive management plans within 2 weeks were formulated in only 28% of patients.